I forgot to add these two pics to the previous post - a "mini Hooded Rider". 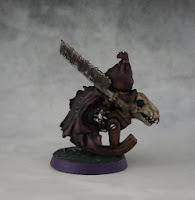 That's a miniature from Puppet Wars. I like it a lot, it's actually kind of cute (my wife likes it more than the original sculpt ;). These miniatures are a lot of fun to work with but they require a different approach. 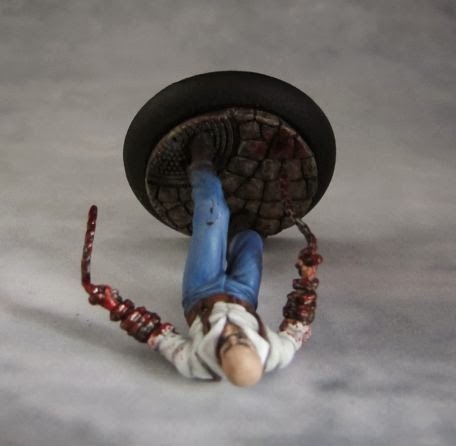 There are more flat surfaces with fewer small details than the Malifaux minis. But they offer excellent opportunities for practicing smooth highlights. Here's another member of the Relic Hunters crew. Like the previous one, he is also full of character and the quality of the model is excellent. While I was working on him I kept thinking that he reminds me of some character. 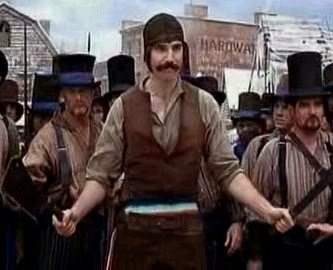 It was only at the finishing stage that I realized it was Bill the Butcher from "Gangs of New York". It was too late so I didn't change the color scheme. 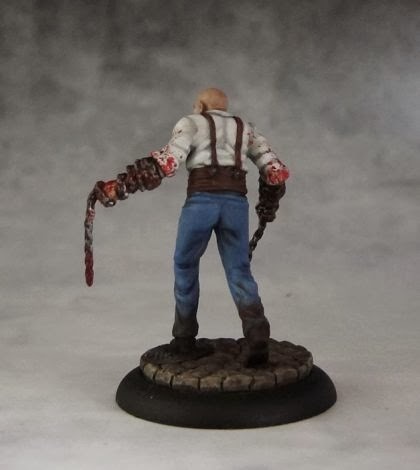 If I had good sculpting skills, I'd add a few conversions to the miniature and paint it over again to make him look like Bill. 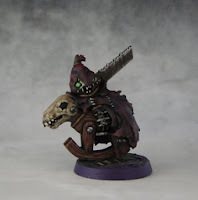 This miniature gave me a chance to work with a new technical paint from GW - Blood for the Blood God. 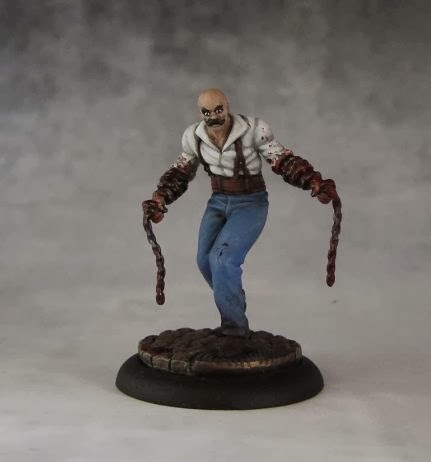 It is... the best "bloody" paint I've ever worked with. It's thick but it's also slightly transparent so that it leaves a very realistic, gory effect when applied. I also used a bit of bright red and dark brown inks from P3 to add a bit depth to the blood effects. I'm pretty happy with his pants. I know they don't have pockets on the back but I decided to make them look like denim as I want each of the Wastrels to look completely different. This one is a big guy so I thought brighter colors would emphasize that effect nicely. Good work! The trousers are the best part, I think. Very smooth. And his crazy gaze is pretty cool, too. Also, nice work on the Hooded Rider. It's a good sculpt, one of my favourite puppets. Thanks! I plan to paint the next Wastrel using mainly dark colors to keep the variety going. I am looking for the Lucius and Hooded Riders cards from puppet wars game. If you had it, would you be interested in selling it? I would make a good offer for the cards. Hi, unfortunately I don't have them. Try using Fb group called Wyrd Trades and off-topic. Cheers!